Completed: Around 1985. 51 units. Italian marble tiles in the living and dining area, teak parquet in bedrooms. Very large family area in units ending in "-02" but 2 balconies are present in units ending in "-01". Units ending in "-02" are above the function room and pool with the tennis court at the side. Tennis playing stops at 11.00 p.m.
Gym, squash, tennis court, pool, children's playground. Big multi-function room. Upgrading completed around January 2000. The first 5 floors have much bigger balconies. The Penthouse on the 27th and 28th floor are asking a rent of $15,000. In good condition. 2 big balconies. 11-01 floor. No afternoon sun for units ending in "-01". One balcony off the living area and one off the family area outside the master bedroom in units ending with "-01" while there is only one balcony in units ending in "-02". 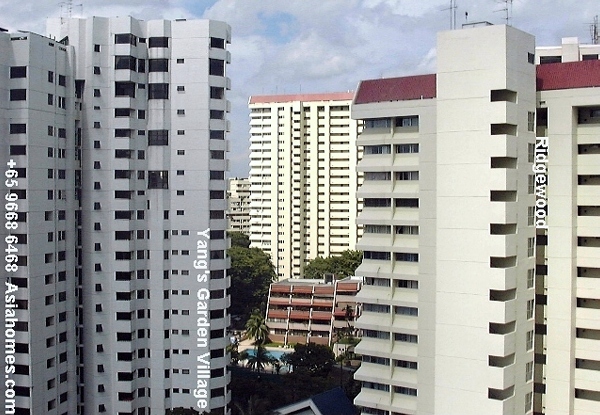 Photo above shows the large balconies of Fontana Heights (right building). The Beaverton with big bedrooms is on the left. There is a green belt of jogging track behind the 2 buildings. Email Judy@asiahomes.com for further information on rental. Kitchens are brighter in units ending in #01 while those in units ending in #02 have darker kitchens as the windows are angled toward a smaller area. This will be the main complaint of the Caucasian expatriate wife. A good breeze can be expected in floors higher than 5. Rainbow-coloured bathrooms. All 4 bedrooms have attached baths, but the original colours are blue, reddish, yellow and brown. After seeing the brand new condos with their gleaming snow white bath tubs and basins, many expatriates just can't stand the rainbow colours. Upgraded big pool, children's pool, mini-mart, 24-hour security, covered assigned car parking, gym, tennis court, squash court, multi-purpose hall. Worse of all, the replacement toilet seat cover may not be matching as the original colours are not available. One may even see a white W.C in a bathroom of yellow bath tubs and basins because the original W.C has broken down. Most owners will have replaced the central air conditioning system with split units as it is extremely difficult and costly to maintain the former. look dated (see photos). Somehow Caucasian expats are not comfortable with such coloured bathroom accessories. Upgrading of premises to a modern condo. Fontana Heights now has new lift lobby areas, cascading waterfalls at pool, a gleaming new pool, tennis court and gym have been upgraded as at Oct 21 2000. Upgrading commenced in 1999. Some owners have not renovated the interiors. 4+1 3600sf $8.5K possible. 10th - 15th floor. Owner will install split unit air conditioners. Units ending with -02 has indirect afternoon sunlight. Breezy and has one balcony. 4+1 3800 sq. ft $9,500. Original brown coloured long bath from the developer, in one apartment. White enamel coated long bath in one unit. Note the floral tiles which was in fashion. 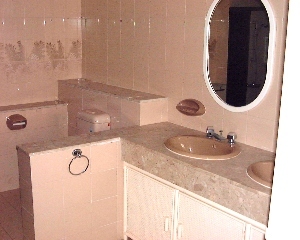 Some Caucasian expats just prefer plain ceramic tiles. New upscale condos now have marble tiles even in bathroom walls. Living area with big balcony. This unit has lots of breezes, slamming the doors shut. Family area with another big balcony. Master bedroom is on left. Kitchen is to the right. All rooms are spacious and have marble flooring. Advert by Realtor: Fontana Heights 4+1 3600 sq ft $14,500. Renovated unit. 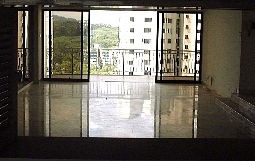 There are various units within the condos described available for rent. The report, based on a house-hunting trip with Asia USA Rental Realtor, introduces condos near the Australian School, favoured by Caucasians. Prospective Tenant: Australian couple, 1 girl, 1 boy, 6 & 10 years old. Near University & Australian School. Rental budget $5000. 170 units of 99-year leases. Marble tiles in living dining area. Swimming pool, children's pool, tennis court, squash court, gym, covered car park, 24-hour security, sauna, playground. See photo of Australian School (background, low rise white buildings. Astor Green is on the extreme right, Cavendish Park is on lower extreme left. Click on thumbnail photos to view larger image. 2-level maisonettes in rambling grass land. Pool squash and security. However, leases will be given till the end of year 2001. No. 149 4+1 2200sf $6K, Pool view of children swimming. Show apartment. Guest room and big maid's room in level 1 while living room is on level 2 facing pool. Lower maisonette. 15 years old. 48 units. Avenue Park 2-level maisonettes. Pool, squash, security. 18/48 units occupied. At least 1 Australian family is resident in this condo. Many German families. No. 164 4+1 with basement 2700sf $5K with remodeling of master bathroom. Lower maisonette. Lots of closet space, hill top. Update: August 16, 2000. Only short less than 1.5 year lease permitted by the Landlord. 254 units with 99-year leases. Although this is a newer condo, the flooring for the living and dining area is ceramic tiled. Bedrooms have parquet flooring. 3+1 1227sf $3K. 2nd floor. Blk 18. No balcony. Very small maid's room and 3rd bedroom is more a study room. Next to Australian School. Biggest unit is penthouse of 2000sf. 3+1 1292sf $3.5K. Ground floor. Facing pool Blk 16. East. Only 2 units face pool. Completed: Around 1998. 70 freehold units. 4-bedroom maisonette: 202-206 sq. m with 3 +1 at first level and attic room with attached bath on 2nd floor. Maisonettes 4+1 2200sf. 2-levels from $8,000. No view but bigger master bedroom. Marble flooring in the living and dining areas, timber strips in the bedrooms. Swimming pool, children's pool, sauna, 24-hour security, visitor's lounge, multi-purpose hall, playground, small gym and covered car park. Opposite Cold Storage gourmet supermarket, the Coffee Bean and other cafes. 21 years old with upgraded facilities as at Oct 21, 2000. 218-363 sq. m with roof terrace. One penthouse has 4+study+maid and roof terrace of 3400 sq. ft. Total area is 6,800 sq. ft.
Flooring in the living and dining rooms are usually ceramic tiles unless the Owner has renovated with marble tiles. Swimming pool, children's pool, tennis court, squash court, gym, multi-purpose hall, mini-mart, 24-hour security, playground, covered car park. The main complaint from Caucasian expats is that the condo is a high density living and that the lifts do NOT stop at every floor. 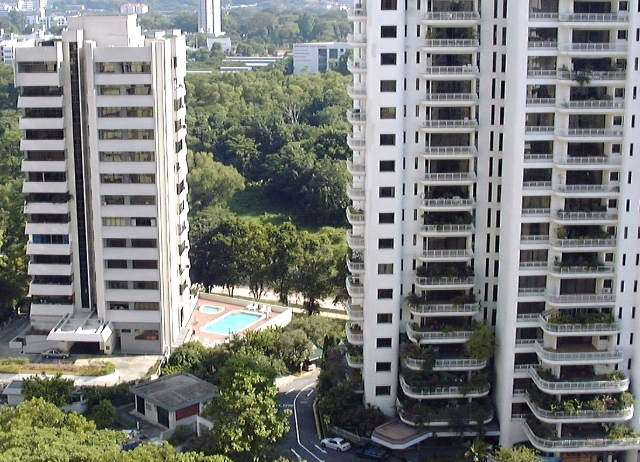 There are lower rise units amongst the high rises. Some Bauhinia blocks do not have blocked views from the living area. However, the condo has been upgraded and is a short 2-minute walk to the Australian School. 4+study+maid 6800sf, $6,000. 3400sf of roof terrace and split level at 16th floor. 20 years old, 623 units. but has upgraded pool and facilities completed around 1998. 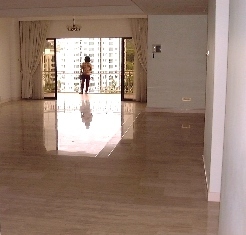 Common corridors and lifts that don't stop at every floor (a practice found in older public housing, the HDB apartments) are characteristics of this condo. Update as at: January 28, 2000. 4+study+maid with a garden at $6,000 on low floor. Renovated. Unblocked view. Bauhinia block. However, fixtures and cabinets cannot be removed. Penthouse 4600 sq. ft $,9000. Bauhinia block. Ceramic tiled living and dining areas, parquet in bedrooms. gym, 24-hour security, covered car park, sauna, playground, fitness track, barbecue area. A Hawaiian resort ambience. #18-04 18th floor. 3 bedroom 1615sf $3.5K fully furnished. White ceramic tiles and 2 white long baths. No maid's room. Panoramic hill views. Sold as at January 2000. #18-01 18th floor. 4+1 2000sf $4.5K. Remodeled to a modern hotel standard. Parquet throughout. New baths. Maid's room has been partitioned from adjoining study room which is the 4th bedroom. Panoramic unblocked green tree views. 60 units with 947-year leases. 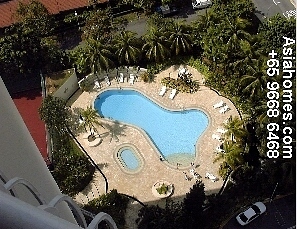 Swimming pool, children's pool, 24-hour security, playground, sauna, gym (very small), covered car park and barbecue area. 3+1 1200sf. Penthouse at 3000sf from $8,000. Very small pool and gym. 5-minute walk to the Australian School. Marble flooring but bedrooms and living areas are much reduced. Update on January 28, 2000. The building is being upgraded but there are several renovated units and the lift lobbies have been upgraded. Open car parking lots, upgraded swimming pool, children's pool, squash court, 24-hour security, half-basketball court and playground. 10 years old, 45 units. Upgrading done in many units. Higher floors are duplexes and have sea views. 3+1 2100sf $5K (remodeled, #03-02 floor), separate living/dining rooms, overlooking pool, balconies x 3, open-concept kitchen, new baths. No tennis court or gym. Has basketball court, pool, security, sauna. 4+1 duplex (15th floor) 7K. 2 spacious bedrooms on level 1. Go upstairs to 2 more bedrooms. Owner will not renovate the bathroom. 3+1 2100sf $5K (remodeled, 03-03 floor), separate living/dining rooms, overlooking pool, balconies x 3, open-concept kitchen, new baths. Afternoon sun and near road. 4+1 duplex (13th floor). 2 spacious bedrooms on level 1. Dark brown doors and worn out furnishing. Amount of renovation depends on rental to be negotiated from $7,000. Penthouse with swimming pool inside the apartment is for rent. Duplex. 5+1 duplex 4000 sq. ft fully renovated, $9,000. 4 bedrooms with attached baths upstairs, one with attached bath downstairs, separate living and dining areas, big bright kitchen, big maid's room. 5+1 duplex not renovated $8,000. Other 3 and 4 bedrooms available. This condo suits Australian expats who want a value for money apartment within a 3-min walk to the Australian School. For the best rental package, contact judy@asiahomes.com or tel: +65 9668 6468. Except for the Fifth Avenue Condos and the Avenue Park Condos which are within a 5-minute bus-ride to the Australian School, all condos described are within a 5-15-minute walking distance to the Australian School. Most Australian, American and European mothers want low floor and view of the pool, in order to check on the young ones. Mothers do not have to spend so much time ferrying children back and forth when the residence is next to the school. There is the saving in bus transport and time too. 3+1 maisonettes at around $3500 if surfers are interested. Email david@asiahomes.com. 2. Yang's Garden Village #03-02 pool view. 3. Avenue Park No. 149 facing pool. Nothing could be confirmed till the parent company confirms the job appointment. It will take around 8 weeks. It was decent of the Australian to contact me to tell me that his employer wanted him to work from Hongkong. Surfers interested in any of the units or the development, please email judy@asiahomes.co or call +65 9668 6468 for an update or free house-hunting. involving the need to gain more hands on experience, listening to advices of your older realtors in your company, farming for owners of new condos and being really good by working on small cases first. Big accounts are not that easy for a greenhorn to close. You are better off gaining on the job experience with smaller accounts. You need to go to the grounds of the new condos to find new landlords if you want to maximise your income by not co-broking. "I don't deal with kachang puteh cases" referring to prospective tenants with rental budgets of less than $2000/month. Obviously, you do not have fire in your belly and are in the wrong profession as a novice rental realtor. "Kachang puteh cases" or "peanuts" in Western expression are small accounts. However, they enable you to gain the necessary experience and if you are good, you get referrals from the expatriates whose colleagues and bosses may be the big accounts. If you are a novice or unknown, you have to start from the bottom as a self-employed realtor. If you want the big accounts, boost up your credibility, competence and work hard. It will take at least 2 years of commitment and focus in Singapore to be able to best your rivals, many of them are from established agencies and from the big boys. There is no free lunch. Expect at least one year of taking up all sorts of cases before you become competent and can qualify exactly what the expatriate want. By the second year, some Owners of big condos or bungalows will get to know of your existence and call you when their units are available for rent. Some expats may refer their colleagues to you. "The expatriate has many realtors serving him!" This is the real world and the customer is king. You will need to be good if not better at qualifying rental condos and if you want to be exclusive, make a name for yourself by providing service above the call of duty. Your referrals from the expatriate will be so many that you don't have time for lunch. You may then get some exclusive from the excellent realtor-tenant relationship built on trust. The free market works in your favour as the expatriate will not have had contacted you if this is a captive exclusive market. It is time for you to work hard and smart, source the good rental housing and not to worry about the competition. You will win some and you will lose some accounts. It happens to all realtors. Put your heart in your career and referrals will come. "You think I can't handle the $10,000 rental budget expatriate?" grumbled one novice when he was told not to handle the case and to focus on his existing cases and smaller accounts. As a newcomer, it is better to continue with what you have than to go after big accounts and compete against the top realtors in Singapore serving them. You will be spending your money and time which could have been put to generate income from small accounts. There are over 1,000 smaller condos to 1 bungalow with a pool and if I send you small accounts, the chances of you closing are much higher in view of the larger supply of such condos. In any case, if you are inexperienced in upscale condos such as penthouses, it is best to gain experience with the smaller rental budget prospects. For starters, there are a bigger variety of choices and you gain experience knowing more about the job as well as closing. These are the common comments of new rental realtors. Many new but older realtors with some working experience think they know better and ignore free advices from me. 2 cases stood out. Disregarding advices of an experienced realtor. One can overlook the obvious sometimes. A new realtor lost a case because he would not take my free advice to include the Regency Park and Fontana Heights in the house-hunting schedule to the expatriate with the $8,000 rental budget. I knew from gut feeling that these 2 condos would be appropriate for them in view of their requirements. A beautiful Harbourview penthouse with sea view (so what?) located away from the expatriate favoured areas was amongst several shown for 3 days and the expat husband seemed to like it. During a Saturday morning break, the expatriate wife met another realtor while visiting a friend at Fontana Heights. The realtor showed the Fontana Heights since she was in the vicinity and then The Regency Park. The other agent closed on The Regency Park. Three solid days of house-hunting, spending time and petrol driving the expats around for zero income. All because 2 obvious expat favoured condos were not short listed. Lost 50% of income although given exclusive marketing right to find a condo for rent. 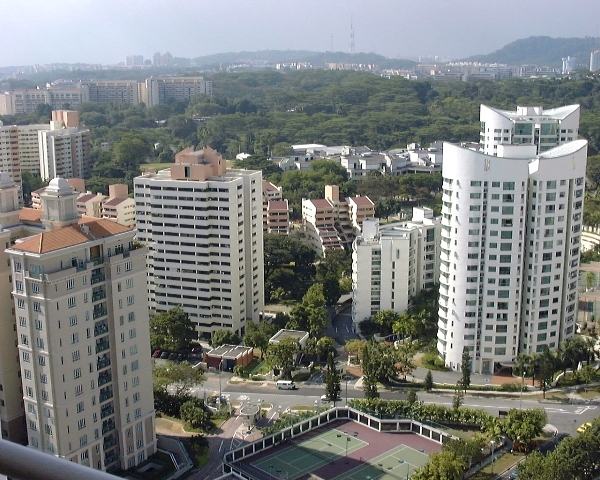 Another new realtor was told to farm a new condo which is within a 5-minute drive to the new French School at Ang Mo Kio Avenue 3. She was given 3 weeks' notice and from the email correspondence of specifications, I guessed that the Frenchman would take that new Regentville condo. It was the only new condo nearest to the French school, so it was not a rocket-scientist discovery. She was the exclusive as he did not use other agents. However, due to lack of farming by going direct to the condo to look for owners, she had to co-broke with another agent. That means a loss of 50% of the income as she split the co-broking fee. New condos usually have many prospective landlords - you need to go out and look for them especially if you have a prospective tenant. Realtors can earn less income for not putting the heart and soul into the profession of a rental realtor. As an independent contractor, you can't afford to repeat such mistakes as you don't get paid if you don't perform. Many times, you will have the first bite of the cherry from expatriates relocating to Singapore and contacting you or Asia USA Realty at judy@asiahomes.com. Qualify your properties, do farming to get Owners and heed advices from old hand and you should be able to bring the bacon home to your families. Of course, you need to devote time to make your expatriate prospective tenant feel that you deserve their business and prefer you to your competitors. Expect competitors, but generally you have the first bite of the cherry. It hurts you economically when you don't plan ahead and therefore unable to close or are forced to co-broke at the last minute, reducing your income by 50%.